 The OAUX Cloud Exchange, where the OAUX team demos near-future and future concepts, was extended to three days this year. Participants included Oracle partners, industry analysts, private customer tours, global media, legislators learning about technology, and a robot, which was part of an emerging technologies demo on virtual reality.  About 250 people came through lab tours at Oracle Headquarters in Redwood Shores, Calif., and nearly 100 customers and partners participated in customer feedback sessions, focus groups and a design jam at the onsite lab.  A new UX Rapid Development Kit (RDK) was also announced in time for OpenWorld. Read about what’s available now in this post on the Usable Apps blog.  The OAUX IoT workshops, a joint project with the Oracle Technology Network (OTN), pulled in about 200 people who attended workshops during three days at both JavaOne and OpenWorld conferences. More tweets are on Twitter, including a short video by ACE Director Tim Hall, who is using the chip that the AppsLab, the OAUX emerging technologies team, provided post-show. He also wrote about it in this post. The AppsLab team wrote about their experiences on their blog as well. ORACLE HCM CLOUD: In September Aylin Uysal, Senior Director, HCM User Experience, was part of an Oracle Partner Network Partner Cast. She discussed Oracle’s HCM UX strategy with host Jonathan Vinoskey, Director of Global Partner Enablement, HCM Cloud, Oracle Sales and Partner Academy. Aylin also points to a recent video from industry analyst Holger Mueller from the Constellation Group, where he talks about what makes a great user experience. Want a preview of what Jeremy Ashley, Oracle Applications User Experience (OAUX) Group Vice President, will say at Oracle OpenWorld 2015 in October? Three new posts on the Oracle UX strategy have been published on the Voice of User Experience, or VoX, blog to give you just that. In the first article of our strategy series, we talk about the transition of the enterprise — the changing workforce, the increasing mobility — and decipher how the user experience of the Oracle Applications Cloud is transitioning with it. Wondering when the innovation will reach your company’s Oracle applications system and affect you, or how much it’s all going to cost? Look no further. This transition doesn’t have to hurt. In our second strategy post, we focus on the theme of mobility alongside the theme of simplicity and discuss where we get our inspiration. All of Oracle’s user experience projects are based on innovation, understanding the most important aspect of a task, and helping improve efficiency and productivity. If you want to know how we’re innovating and what we’re researching, read on. Emerging technology is only the beginning. Consistency, Context, Convenience, Participation? Check! Our third strategy post digs into specifics and discusses the challenges and opportunities Oracle’s R&D team is facing in order to design that mobile user experience. You know that if users don’t like the system, they won’t use it, so what do we need to do to maximize participation? You won’t want to miss this. The UX PaaS4SaaS: Enabling Oracle Applications Cloud Partner Confidence social story tells how partners and customers use Oracle PaaS to build SaaS integrations focused on a quality user experience, to innovate in the Cloud and benefit their businesses. Find out how the Oracle Applications User Experience team’s Rapid Development Kit (RDK) lets partners differentiate and build modern, must-have user experiences for the Oracle Applications Cloud. And hear what industry thought leaders have to say about building modern apps in faster and smarter ways by using Oracle UX and the Cloud toolkit. Visit Oracle University for a new webcast for partners, “Oracle Applications Cloud User Experience Innovations: Visualizations.” The webcast is also available via Customer Connect playback. Ultan O’Broin, with the OAUX Communications & Outreach team, writes on the Usable Apps blog that the ERP user experience is no longer just icing on the cake. It’s central to user happiness and business productivity, satisfying that ever-ravenous appetite for consumerlike apps in the enterprise. Read his post, “From Cupcakes to the Cloud: Oracle ERP User Experience Bakes In Exceedingly Better Business*,” for more. Finally, Gretchen Alarcon, Group Vice President, Product Strategy, takes a look at what’s coming for the Oracle HCM Cloud in Oracle Applications Release 10 Spotlight on HCM Cloud, a new video on YouTube. There’s a lot to be excited about on the emerging technology front right now, especially around wearables. Oracle’s investment in user experience around emerging technology — what we’re researching, how we think wearables and other new technology like the Internet of Things (IoT) could fit into the enterprise world, and defining Oracle’s strategy in user experience going forward — is a major focus for us now and in coming months. You may have seen The AppsLab’s post on the Apple Watch, The Apple Watch Arrives, in this space last month. We also talked about how the Oracle Applications User Experience (OAUX) design philosophy of “Glance, Scan, Commit” fits the wearables model on the Usable Apps blog. We’ve had some more time to sit with it all. Take a look at these new posts on — of course — the Apple Watch, as well as other devices that can activate the Internet of Things. We also have a free ebook, in which you can get a strategic look at the roadmap for the Oracle Applications Cloud. Download your copy today. See how wearables like the smartwatch fit into Oracle’s user experience strategy — specifically our “glance, scan, commit” design philosophy — from the Usable Apps blog. Gurbinder Bali from the JD Edwards team offers up a whitepaper on wearables. UX EVENTS: Visit the Usable Apps blog to find out where we’ve been lately, and what you can expect if you attend an event that features the Oracle Applications User Experience (OAUX) team! If your focus is the Oracle HCM Cloud, watch “Oracle HCM: Manage and Retain Your Key Talent” and watch the simplified UI get the spotlight in this story about the user experience of Ted, a rising star in a global architecture company. See how he can easily understand his individual goals and performance and drive his development in a review with his manager. EMERGING TECHNOLOGY (AKA GADGET) NEWS: Head to The AppsLab blog if you’re interested in emerging technology that our team is researching as we build the next evolution of the Oracle user experience. There’s a new post on the Android Wear watch and another recent one on Automatic, a gadget that purports to make you a better driver. Over on the Voice of User Experience (VoX) blog, we’ve given a recent Storify post on the Internet of Things some extra fresh air. Read it to learn how the Internet of Things is influencing Oracle’s user experience strategy. IN CASE YOU MISSED IT: Have you seen where the Oracle user experience is heading? If you didn’t get to attend one of our recent events in San Francisco or London or if you can’t come to Oracle Headquarters to tour the new Cloud UX lab (and even if you can), check out our new e-book on the Oracle user experience strategy. You can also watch Thomas Kurian, President of Oracle, explain why user experience is pivotal to customer experience in this recent video. Oracle’s Platform as a Service (PaaS) is a huge opportunity for Oracle partners. Using PaaS4SaaS for extending the Oracle Applications Cloud and building simplified UI solutions are powerful differentiators combined. Add in user experience (UX), and it’s a competitive must-have move for business. The Oracle Applications User Experience (OAUX) communications and outreach team has been on the road enabling partners to make this competitive potential real. Our first PaaS4SaaS enablement in 2015 was a three-day, hands-on design and development event with Certus Solutions, which was held at the Oracle London City office in the UK. An awesome range of UX and technology skills from OAUX and partners was brought to bear on realizing a Cloud solution with attendees self-organizing and working seamlessly together in small agile teams. All the stakeholders. Certus Solutions, eProseed and OAUX developers and designers collaborate. (L-R) Caroline Moloney (Certus Solutions), Lancy Silveira (OAUX), Mascha van Oosterhout (eProseed), and Julian Orr (OAUX). In the background are Debra Lilley (Certus Solutions) and Amit Kumar Bhowmick (OAUX). Certus Solutions has partnered with eProseed to accelerate its PaaS offerings for extending the Oracle HCM Cloud and Oracle ERP Cloud, and participants from both companies were at the event*. Facilitated by the OAUX design and development chops, this powerhouse of a team wireframed a great business solution for the Oracle Applications Cloud, built it using the simplified UI RDK, and deployed the result using the Oracle Java Cloud Service SaaS-Extension (JCS-SX) PaaS offering. Read the complete article here. UX WHAT’S COMING IN 2015? Catch up with the Oracle Applications User Experience (OAUX) team in Santa Fe, Mexico, next. Register now for one of our executive briefings for select partners and customers, where you’ll see the strategy and roadmap for the Oracle user experience. Read the Voice of User Experience, or VoX, blog for more information, or go to the registration page directly. The VoX blog also has a post on what’s next for the Oracle Applications Cloud user experiences, and the Usable Apps Events pages shows where our team members will be in 2015. RELEASE 9: Head to the VoX blog for new posts with screenshots of Oracle HCM Cloud and Oracle ERP Cloud. Debra Lilley, OAUX Speaker and longtime friend of the team, also wrote an article on user experience for UKOUG’s current issue of Oracle Scene online magazine. UX DIRECT: The Oracle Applications User Experience team continues to take the pulse of our customers and obtain feedback on making usability a priority. The UX Direct site has been updated to include new design tools to help Oracle customers move toward cloud applications and understand how to simplify solutions. We have created simple checklists for UX Readiness for Cloud and Design Best Practices. 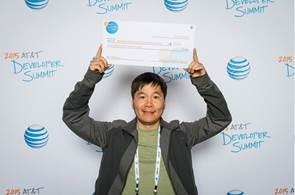 Members of the AppsLab team, part of the Oracle Applications User Experience group, headed to Las Vegas for the 2015 AT&T Developer Summit Hackathon in early January. Anthony Lai and Raymond Xie won the Accelerator entry with their project, Sensus. Read more about their project and other entries on the AppsLab blog. ORACLE VOICE: A new press release went live in the last month on Oracle Voice for the Oracle Sales Cloud. The news was published quickly on CNN’s Money page, by the Computer Business Review, and on Market Wired. ON RELEASE 9: Head to the Usable Apps YouTube channel for a new play list on Oracle Applications Cloud Release 9 demos. 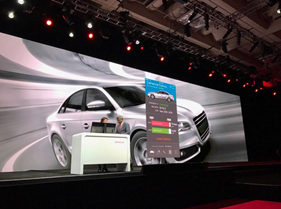 You’ll see demos that focus on user experience highlights in the Oracle Sales Cloud. FOR ORACLE PARTNERS: Visit the Usable Apps website for new information directed at Oracle partners. Find links to the new OAUX strategy ebook, the UX Specialist Role, and upcoming partner events. Learn how you can be more connected and be among the first to see our latest demos. The new Oracle Cloud User Experience (UX) lab is officially open for business! Located on the bottom floor of the 200 building at Oracle headquarters in Redwood Shores, Calif., it hosted its first tour during Oracle OpenWorld 2014. We can’t stop talking about it though. The Oracle Applications User Experience (OAUX) team has written about it on the Voice of User Experience, or VoX blog, and again on the AppsLab blog. Can’t come to HQ to see the Oracle Applications user experience for yourself? Learn about the UX roadmap in a new, free eBook from the Oracle Applications User Experience team. Find the download link on the VoX blog. Oracle Applications User Experience Vice President Jeremy Ashley in the new Oracle Cloud UX lab. Onsite labs: Head to YouTube for a new video that shows what happens in the OAUX onsite labs, held at user group conferences near you! The video has also been posted on the Oracle Media Network. Oracle Voice: Also on YouTube is a series of videos that show Oracle Voice, a new voice-activated application, in action. Visit the Usable Apps YouTube channel for a playlist that collects up all the latest demos. Simplified UI in PeopleSoft, EBS: The simplified UI is continuing to enhance the user experience in recent versions of PeopleSoft and E-Business Suite. Visit Oracle blogs to see the PeopleSoft Fluid UI and new user interface features in E-Business Suite. Oracle Partner Network (OPN): Misha Vaughan, director of the OAUX Communications & Outreach team, takes part in a discussion on the Oracle Applications User Experience in this video for Oracle partners. If you’re building or integrating the Oracle Applications Cloud or building SaaS through PaaS, use the User Experience Rapid Development Kit laid out here to get the guidance you need and point you to the right tools to use. The Oracle Applications User Experience team has released a User Experience Rapid Development Kit on simplified user interface (UI), the same user experience design in Oracle Applications Cloud release 8. The kit is designed to help Oracle ADF developers get up to speed quickly so they can start designing and building the Oracle Applications Cloud simplified UIs, which are the tablet-friendly UIs for Oracle Sales Cloud and Oracle HCM Cloud, in a matter of hours. Coding tips from Oracle’s developers. ADF screen overlays showing the use of components in the simplified UI. An eBook on user experience (UX) design patterns and guidelines(right), and example wireframe stencils of page types and components in Microsoft Visio and Balsamiq Mockups formats. Sample wireframe of a simplified UI page flow. Tell me more about the simplified user interface for Oracle Applications Cloud. Show me demos of simplified UI in the Oracle Applications Cloud. 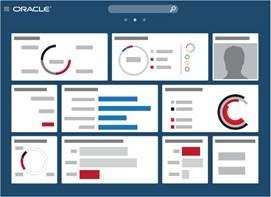 What’s coming next in the Oracle Applications Cloud user experience? Become a UX developer guru. Follow the UsableApps blog to see what’s next for applications cloud developers. See where Oracle Applications Cloud user experiences are going next. Share your design with us on Twitter: @usableapps. Check our Events pages and meet up with us at a conference near you.